From a pregnant Fordham University law professor-turned-progressive insurgent, to New York state's first openly gay congressman, to three African-American women, the Democrat who wins Thursday's neck and neck primary for New York attorney general is poised to make history as the state's top cop. The race for the open seat, vacated by Eric Schneiderman in May amid allegations of physical abuse by four women — and filled temporarily by then-solicitor general Barbara Underwood — has attracted national attention for its significance: jurisdiction over President Trump's sprawling business and real estate empire, and the ability to investigate the mogul-turned-commander in chief. New York City public advocate Letitia James, professor Zephyr Teachout, Rep. Sean Patrick Maloney and Verizon executive Leecia Eve are wrestling over who can make the most aggressive pitch to take on the president. "You can’t understate the threat of Donald Trump and the Trump administration to our laws and democracy," Teachout told ABC News in an interview Tuesday. "I’m running for attorney general because Donald Trump is a clear and present danger, because he is a crook and a bigot and he has a bulls-eye on New York," Maloney said during the final debate in New York last week. Earlier in the race, the congressman ramped up his rhetoric against Trump in a television ad, in which he said: "I feel like there’s a group of men who have shown up with Donald Trump in the front yard and they’re getting ready to tear this house apart. And I’m going to stand in the hallway with a baseball bat, because I don’t have a choice. My kids are upstairs asleep." The progressive state is both home to the president and to several major lawsuits against him. 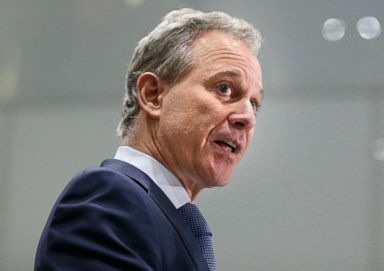 Before his stunning fall, rising star Schneiderman surged to national prominence after a series of legal confrontations with the president related to financial and regulatory cases in New York. 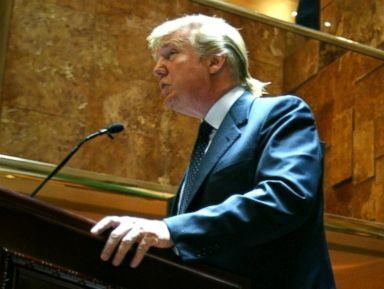 Donald Trump speaks at a press conference in New York to announce the establishment of Trump University, May 23, 2005. In 2016, Schneiderman opened an investigation into the Trump Foundation for alleged improprieties — and later that year, he ordered the foundation to stop fundraising. Another Trump-related probe, the case against Trump University over claims of fraud, ultimately led to a $25 million settlement. Schneiderman also targeted the president’s political endeavors through amicus briefs and legal proceedings, specifically against White House environmental and immigration policies. In 2017, along with New York Gov. Andrew Cuomo, the attorney general released a statement warning legal action if the Trump administration ended the Deferred Action for Childhood Arrivals (DACA) program. With the cloud of special counsel Robert Mueller’s probe hanging over the White House, all four Democratic candidates have made Trump a central figure in their campaigns, attacking the president’s policies and pledging to hold him accountable if elected. "As New York's next attorney general, I will work hand-in-glove with Mueller to stand as a backstop against Trump's attempts to evade civil and criminal responsibility," Maloney said in a statement. 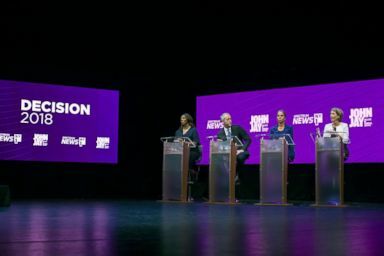 From left, Letitia James, Sean Patrick Maloney, Leecia Eve and Zephyr Teachout debate for New York State Attorney General during a Democratic Primary at John Jay College of Criminal Justice, Aug. 28, 2018. Teachout, a progressive endorsed by Vermont Sen. Bernie Sanders, Democratic socialist Alexandria Ocasio-Cortez, and The New York Times editorial board, shared her four initial priorities with ABC News: taking on alleged illegality in Trump’s businesses emoluments, corruption in Albany, addressing the increasingly hostile federal judiciary, and pushing to end mass incarceration. "Our campaign is driven by grassroots supporters who want a real change in New York and the best person to take on Donald Trump," she asserted. James, who has received endorsements from Cuomo and other top party leaders in the state, also said she is committed to challenging Trump on day one. "We are at a pivotal point in our country’s history, with an illegitimate president working in Washington, D.C., to pull us backwards and forces here in New York fighting against progress," James said in a statement to ABC News Wednesday. "From my time as a public defender to serving as Public Advocate, I’ve spent my career giving a voice to the voiceless. And on day one, that’s exactly what I’ll do. I'll take on Trump’s harmful policies, go after corrupt officials, and protect New Yorkers from gun violence, abusive landlords, and polluters." James is not only the first woman of color to hold a citywide office in New York City but also the first woman of color to use her platform to address criminal justice reform. The other female African-American in the race, who worked for top Democratic leaders like Cuomo, Hillary Clinton and Joe Biden, has also not shied away from condemning the Trump administration on the trail. "You need an experienced advocate to fight against Donald Trump and all that he is trying to do to undermine our rights," Eve said during the final debate. Trump might be the impetus behind their campaigns, but it was the swift departure of Schneiderman that set off a tight contest to succeed Underwood — the first woman to hold the position — in a year featuring a diverse array of candidates for higher office. There are currently no sitting African American governors in the country, but voters in Florida and Georgia can possibly change that in November after three Democratic contenders advanced to the general election. 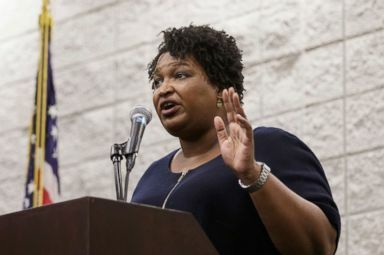 If elected in November, both Democratic nominees Ben Jealous and Andrew Gillum will be their state’s first black governor in Maryland and Florida, respectively, and Georgia Democrat Stacey Abrams will be the first black female chief executive in the nation’s history. Democratic candidate for governor Stacey Abrams speaks during a town hall forum at the Dalton Convention Center in Dalton, Ga., Aug. 1, 2018. Women are making a remarkable number of historic firsts: A record-breaking 529 women ran for Congress in 2018, and female candidates secured the highest number of U.S. Senate, U.S. House, gubernatorial and state legislative nominations in the country’s history, according to Rutgers University’s Center for American Women and Politics. "President Trump has certainly energized [Democrats] a lot," Georgetown University political scientist Michele Swers said Wednesday. "You just have an increase in the number of candidates on the Democratic side, which is then also an increase in the quality ... Democratic voters seem to want to elect more diverse candidates." The winner in Thursday’s Democratic primary will face political newcomer and African-American lawyer Keith Wofford, who is running unopposed in the Republican primary — ushering in a historic tenure for whoever wins in November. ABC News’ Aaron Katersky and Meghan Keneally contributed to this report.